Why this Organizer? 1) It will make you look great by keeping your bag in shape and organized. 2) It is light weight, durable, and easy to clean. 3) Made of high quality, soft, durable and sturdy 3mm felt fabric, it will provide years of protection for your bag. 4) Comes with 10 pockets, providing you with ample storage compartments. Keep your personal items in order and keep things from moving around. 5) It can also be used as a diaper, sewing, toy, art and pencil storage bag. Perfect for travel. Size Chart:Small: 9.4" L x 5.5" W x 5.5" HMedium: 11.0" L x 5.9" W x 5.9" HLarge: 13.0" L x 6.3" W x 6.3" H Dimensions For Your Reference:LV Speedy 25: 9.8" L x 5.9" W x 7.5"HLV Speedy 30:11.8" L x 6.6"W x 8.2" HLV Speedy 35: 13.8" L x 7.1" W x 9.1" HLV Neverfull PM: 11.4" L x 5.1" W x 8.7" HLV Neverfull MM: 12.6" L x 6.7" W x 11.4" HLV Neverfull GM: 15.6" L x 7.9" W x 12.8" H Buy this organizer insert now so you can get organized, save time, protect your investment. Money Back Guarantee: Love it or we will return 100% of your money, no questions asked! STAY ORGANIZED: Keep your personal items in dedicated pockets and prevent things from moving around. Quickly and easily find your personal items. Save time and reduce the stress of hunting for items in your bag. SIMPLIFY YOUR LIFE: Change bags without having to take out all your items and putting them in a different bag. PROTECTOR: Keep your bag clean and help protect the inside of your bag against spills and stains from leaks. Help keep sharp and pointy objects such as keys from scratching and damaging your bag. SHAPER: This light weight and durable organizer will help your bag keep its shape and form, protecting it against bending over and forming creases and going out of shape. Add volume to your bag. MEASUREMENTS: SMALL: 9.0" L x 5.5" W x 5.5" H. MEDIUM: 11.0" L x 5.9" W x 5.9" H. MEDIUM SLIM: 10.6" L x 4.5" W x 5.9" H. LARGE: 13.0" L x 6.3" W x 6.3" H. LARGE SLIM: 13.0" L x 4.9" W x 6.3" H. X-LARGE: 15.0" X 6.7" W X 6.7"H. Just measure your bag inside dimension for fit. 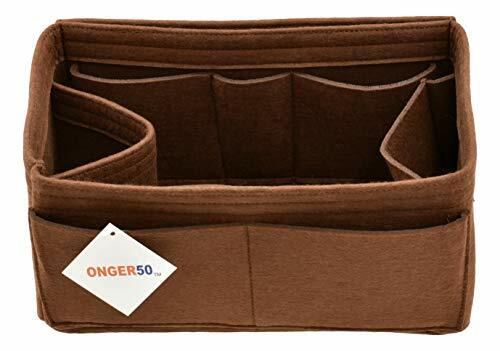 If you have any questions about this product by ONGER50, contact us by completing and submitting the form below. If you are looking for a specif part number, please include it with your message.